Spring season in Branson is a great time to enjoy a perfect vacation where you can see the first blooms of flowers and plants in the wildlife of the Ozark mountains. During spring season, it’s wonderful to enjoy viewing the lush greenery, cruising on the lake, feeling the cool mornings, shopping or dining in malls, and watching live entertainment shows. As Branson is beautifully located around the Tri-Lakes area, it makes the place one of the best tourist destinations in the Midwest. With the lakes around the area, you can imagine the vast opportunity of enjoying water sports adventures and other outdoor activities. When you take a spring vacation in Branson, you will certainly enjoy every bit of your time with a variety of exciting activities and wonderful attractions. As the rain pour in the Ozarks during spring time, lush greenery flourishes while redbuds, dogwoods, and wildflowers bloom. Spring in Branson is really the best time to enjoy as the season’s temperature averages from 50 to 80 degrees which means sunny days while the evenings are refreshing and cool. Branson’s live entertainment shows and beautiful theme parks have features of world-class performers, exciting acts, amazing exhibits and thrilling rides. In Branson, you will get the chance to see spring events offering the most fun activities and exciting attractions. 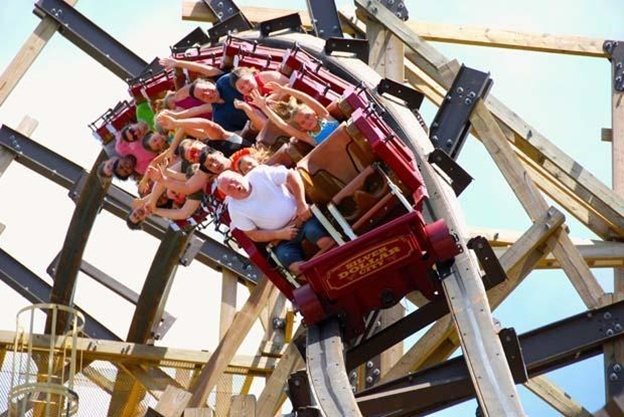 In Silver Dollar City theme park, you can experience the most thrilling and the most exciting RiverBlast and multi-level go kart tracks that can be an unforgettable ride of your life. The park features 40 shows and 30 thrilling rides to entertain visitors of all ages. Silver Dollar city also features treetop fun houses, a play area with climbing nets, a carousel, and a sand tables. In the entertainment district in Branson, there are about 50 theaters where you can enjoy movie shows and live entertainment performances. You can also visit some of the most interesting museums such as Ripley’s Believe It Or Not Museum, Titanic Museum, and Hollywood Wax Museum. Pose beside the almost real life wax figures of some of the Hollywood legends such as a leather clad James Dean, Elvis Presley, John Wayne, and Michael Jackson. If you want to experience attending a wonderful show with dinner, watch the Dolly Parton’s Dixie Stampede Dinner & Show. You will be served with several delicious dishes including roasted chicken while watching a very extraordinary show. In this amazing show, you will get the chance to watch costumed southern bells, Civil War soldiers, 32 trick horses, and a unique show giving tribute to America. Your enjoyment with the exciting activities and entertainment shows will not be complete if you don’t go shopping. In Branson, you will find shopping malls with over 200 specialty shops that will have you shop for more till you drop. If you have not decided yet where to go for your perfect spring vacation, try to visit Branson where you get to enjoy the many fun activities offered during spring season.